This week’s one word prompt is Nature. So many to choose from this week, such a large proportion of what I view to be beautiful and then point my camera at is based in nature. I decided to go with the engineering marvel that is honeycomb. I could look at it all day long, lost in the intricacies of the structure built by bees. Two weeks ago I was fortunate to spend a day in the company of two passionate natural bee keepers who have shunned the ‘factory farming’ of bees practiced by many who keep bees in favour of a far less impactful, hands off approach. It was fascinating and I learned so much about bees. You can check out their website here. They do not provide frames for bees to construct within, but use top bar hives which have narrow strips of timber across the top and then lots of space for the bees to build in free form shapes. 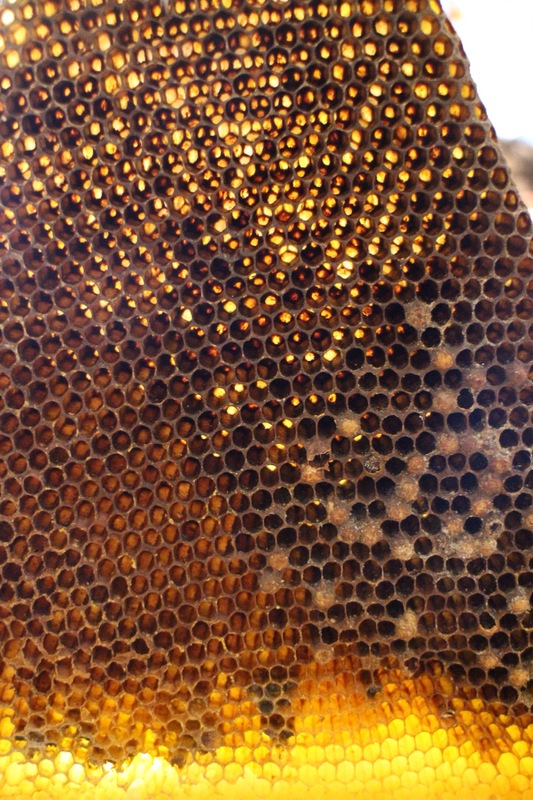 This is a section of comb removed from one of their hives when the bees swarmed. As I mentioned last week I am trying to find a new rhythm to my posts since the Yarn Along ended last month. I want to share what I am working on as I don’t want the inevitable reduction in the frequency of posts associated with only sharing finished objects. Nicole at Frontier Dreams is running a weekly link up for people to share their ongoing craft work and this might work for me to fill the big gap left by Yarn Along. Let’s try it this week! The other nice thing about weekly check ins is how they work when you are on a big project. Last summer I was sat picnicking with a good friend when she asked me if I would make her a blanket for her bed. Of course I said yes and promised it for her birthday the following July, giving me over a year to work on it. But I did not make the most of this long deadline! Instead I started in late January, benched for all of February and March, and only picked it up again last week. I will meet the deadline though. And so that means ignoring the tempting call of all of the wonderful patterns in my Ravelry library, and the yarn on the shelves and focussing in. I am using the Spice of Life Pattern by Sandra Paul of Cherry Heart at double width to cover a king sized bed (just another 5ft or so to go!) and a selection of colours of Stylecraft Special DK in a random order. I am quite looking forward to posting weekly updates and watching it grow so in one format or another I’ll be back next week! This week’s one word prompt is Lunch. As a parent to three young children I cook a massive amount of pasta each week for lunch. This week they are favouring psketti over other shapes and I love the look of the strands all tangled together in the colander before they were split into three bowls and covered in three different sauces! There is something so satisfying about finishing a pair of socks. And these socks are especially pleasing as they have turned out to be so gorgeous. I bought The Sock Drawer book from the lovely Verity Castledine of Truly Hooked at Yarndale last year but have been too busy hooking to knit socks. I knew that I wanted my first pair this year to be from the book though and spent a while agonising over which of the patterns to choose. I went with Rhian because it looked to have the perfect balance of being a straightforward pattern with complex looking results and on that front it definitely delivered. I went with a plain yarn to allow the pattern to shine and chose the Butterscotch colour way from the West Yorkshire Spinners Signature 4ply range. I used this yarn in a different colour to make my Dragonfly Socks last year and so knew it was lovely to work with and deliciously soft. I love these socks and am so pleased that they are finished and ready to gift. These are the words the lovely Ginny at Small Things used to open her blog post each Wednesday for over 6 years before inviting people to also share their current makes and reads, an invitation I readily accepted when I first started blogging and was keen to find other people with similar interests to me. I have loved joining in with the Yarn Along and was sad to hear that Ginny had decided to stop hosting. So what now? I’m not sure! Where Ginny is hoping to find more spontaneity in her blogging I love having the structure of knowing that certain days are for certain subjects and worry that without them the frequency of posts may dwindle and content be limited only to finished objects. So maybe I’ll move to Work in Progress Wednesdays, or perhaps a weekly roundup on a Friday? I will be continuing with the Weekly Photo Challenge on a Tuesday so am drawn to something later in the week. Or I might just continue Yarning Along but without the link up. I definitely intend to continue Yarn Along on my Instagram so it perhaps doesn’t warrant duplication. Decisions decisions! But for now, while I consider next steps, here is this week’s Yarn Along. On my kindle The Power by Naomi Alderman. On my needles almost a full pair of Rhian socks. I am absolutely gripped by this book. I only started it yesterday bedtime but am struggling to put it down, only stopping last night when the kindle hit my nose when I just couldn’t hold it up any longer and sneaking every minute I can squeeze out of today. The sock pattern is Rhian from The Sock Drawer book by Verity Castledine (available to buy here) made with West Yorkshire Spinners Signature 4ply yarn in butterscotch and I love them so much. Not much more work to do here until I have the pair finished and ready to gift. Before I started this book I thought I may get them finished today but that is now looking unlikely! I am hopeful they’ll be done by the end of the week though. This week’s one word prompt is Pond. After reusing a photo last week this week I was full of good intentions with a list of gorgeous ornamental ponds locally or the RSPB reserve where there ponds are brimming over with exciting wildlife but the week ran away with me and none of these trips happened! And so at 7pm yesterday I found myself striding down the village to the fishing pond and taking this photograph of a lone fisher making the most of these longer evenings and trying to make a catch before the sun went down. I think at the end of the year and this weekly photo challenge I will count up and see how many of the photographs were taken within walking distance of home, it’s a large proportion so far!